Don't worry -- there are logical impulses for both thoughts. 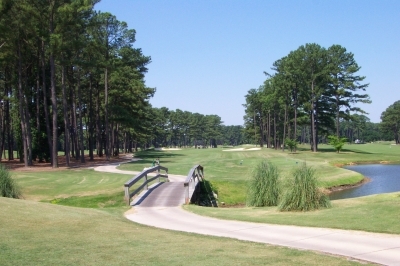 For the first, the course was completely redone a couple years back, transforming a perfectly flat piece of property (6" variance from front to back) with a few flagsticks and overgrown pine trees into an incredible, undulating, virtually brand new golf course. Second, 'Bide-A-Wee' is Scottish slang for 'Come stay awhile.' Scottish architect Fred Finlay suggested the name when he originally designed the course, and it's stuck ever since--despite the considerable deterioration that plagued the layout in the decade before its renovation. The personal touches aren't lacking at Bide-A-Wee. It has a very 'non-muni' atmosphere. Opening in 1955, Bide-A-Wee has a long and storied history -- some highlights, and some not so high. 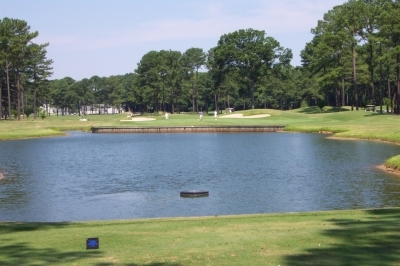 Amongst the former was its hosting of several notable tournaments, including the World Amateur Championship -- as well as the fact it was the home course for two-time US Open champion Curtis Strange during his formative golfing years. Bide-A-Wee's long time benefactor, Chandler Harper, took over as mentor and role model for young Curtis upon the passing of his father during his teen years, and their friendship has endured. In other words, this place wasn't just another public park golf course where you'd lay down your two bucks and make your way around the layout, dodging poison ivy and snakes along the way. The City of Portsmouth seemed to recognize the potential of Bide-A-Wee, and put its money where its policies were -- resulting in an $8.5 million renovation project. 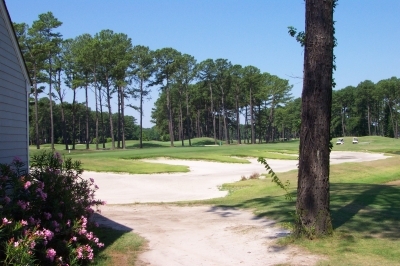 Tom Clark served as course architect on Bide-A-Wee's rebirth (with extensive consultation by Curtis Strange). He describes what he saw when he first looked over the project: "When we first got there, it was apparent there were major problems with the property. If it rained, the course would close for three days because the drainage was horrible. The pine trees had grown up so high that a couple of the holes were impossible to play--and there was no turf of any good quality or substance to work with. So, we looked at it as a total rebuild." 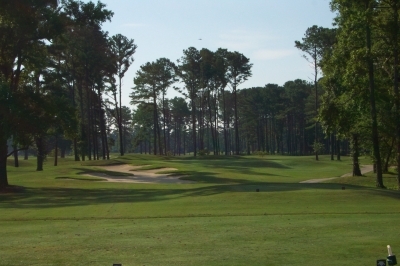 Bide-A-Wee was quite open in the old days, but the pine trees planted in the mid-fifties grew profusely in the half-century since, squeezing fairways and sight lines along the way. Many of them had to go. Clark said one of the first orders of business was to hire a logging contractor to take out about 5,000 trees. Even though thousands of trees were removed during its facelift, thousands more still remain to define and beautify the course. Then they added a few lakes -- to provide a place for rainwater to drain, but also to furnish soil to build in some contrast for the course's fairways & green complexes. Further, a new clubhouse and cart barn were added to step up the property's service facilities. Finally, the City condemned 24 World War II vintage temporary structures along the border of the property that were sheltering all sorts of sordid criminal activities prior to their destruction. In their place is a nice new entrance and grassy area. When the project was done, it was a more thorough makeover than any you'd see at a mall near the makeup counters on the even the busiest of days. And the end product is really quite surprising. The term 'muni' brings with it some awful negative connotations, but you'd better start rethinking your biases and check this place out. Bide-A-Wee is lush -- it now boasts 419 Bermuda Fairways and L93 Bentgrass Greens -- the same strains you'd find at many an upscale course that costs double (or triple) to play. It's obvious the layout receives a good amount of play, but the conditioning is still excellent. It may look like a watery golf ball grave to some, but these ponds are vital for drainage to this rather flat piece of property. Andy Giles, Bide-A-Wee's Director of Golf, says it's the new layout, as well as the conditioning that makes the course attractive: "People really seem to like it because it's in great shape, but also because it's very playable if you choose the right set of tees. We took out thousands of trees during reconstruction, but the layout's still really tight in spots. You'll need to put it in the fairway to do well." "Another thing about it -- the course has a good mix of holes -- some pretty tough ones, some medium in difficulty, and some are pretty easy. You won't come out here and get beat up by a bunch of tough golf holes in a row -- we've got them mixed up pretty well." Thanks to Tom Clark and Curtis Strange for that. Clark says they worked with hole lengths and par to give the layout some variety that was lacking in the 'old' Bide-A-Wee. It all comes together very well. Both nines start out with a par five, from a dual tee pointed in slightly different directions -- I thought that was kind of neat. The opening hole measures only 508 yards from the back tees, making it definitely reachable if you manage to avoid the fairway bunkers on the left and water on the right. Some nice bridge work at Bide-A-Wee. The second hole is part of what makes Bide-A-Wee unique, and special. The hole's name is 'The Tree,' and standing on the tee, you'll know why. There's a huge tree in the middle of the fairway that influences your thoughts on the tee shot -- but either side is fine! It's also long at 431 yards, so take out the driver and hope your ball doesn't end up with splinters. Seven is a great par three. Named 'Loch McCoy,' it's 230 yarder with the 'Loch' on the right, but there's a generous runup option on the left side and a green with no bunkers. Hit your five-wood short, and par's still within reach. Eight's an interesting hole, and one where it'll play easier the second time around. 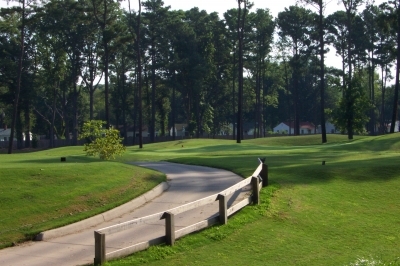 Named 'Long and Difficult,' the view from the tee shows a dogleg left with trees bordering the length of the fairway. Giles says "the eighth used to be darn near impossible before they cleared many of the trees to the left side, creating, in effect, a split fairway." The left-side option brings a lake into play on your second shot, but will cut off some of the distance. I didn't look close enough on my tee ball (I actually didn't even notice the split option), or I might have considered trying the left side. Nine's a short, easy par four that Giles says "even high handicappers can make par at." Well put (and the hole's called 'Little Recess'). It measures 315 yards, and is not really reachable, even for very long hitters -- due to bunkers in front. But anything close to the green makes for an easy pitch and a birdie try. Not even morning shadows can obscure the attractive bunkering at Bide-A-Wee. Back nine highlights start at number eleven. Nicknamed 'Tight,' the moniker is certainly true for the left side of the hole -- but there's plenty of room to miss right -- that is, unless you don't like sand. Tom Clark and Curtis Strange always try and put a drivable par four or two on their courses, and this one's the most accessible at 292 yards -- but you better be able to draw it in. 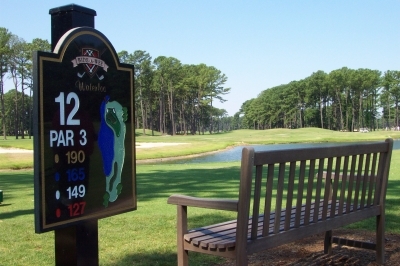 Twelve is a classic par three, known as 'Waterloo.' Once you see it, you'll know why. Not grizzly long at 190 yards, Waterloo's challenge lies in its full water carry. And it's longer than it looks -- hint -- if you're into the wind, play an extra club (at least), or head for the ball pocket on your bag. Even a well-struck iron for the distance will end up swimming -- I should know. The closing holes are as fine as you'll get anywhere. The seventeenth is a 552 yard three shotter with water guarding the front and left side of the putting surface, along with a bunker perched conveniently in front. Play it smart and par's a good score. Eighteen is a 393 yard dogleg right, but water guards against any tee ball trying to cut off too much distance on the right. Don't get greedy, and don't be distracted by the pleasant looking fountain in the middle of the lake. Bear down and finish strong. You'll be surprised at the quality of playing conditions for a relatively inexpensive municipal course. Looking back on the course after finishing, you'll harken back to your original thoughts on seeing the property for the first time. You still won't believe the layout is a municipal course, which is a good thing -- but you'll definitely want to Bide-A-Wee again, sometime real soon. Where to Stay in Portsmouth: The Renaissance Hotel! Downtown Portsmouth lies directly across the Elizabeth River from downtown Norfolk. Nothing like combining the best these two seafaring cities have to offer -- in both the old-style charm of Portsmouth, and the more modern-day life of Norfolk. Norfolk is the home of the United States' largest Naval base, and there're more than enough maritime themed museums and historic sites in both cities to occupy your non-golf hours. 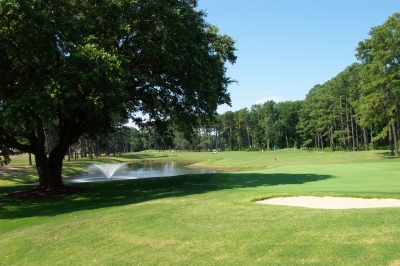 I'd recommend staying at the Renaissance Hotel because it's the newest and nicest hotel in the area, easily accessible to great golf, such as at Bide-A-Wee, or even a short drive to some of the excellent tracks in the Virginia Beach area, such as The TPC of Virginia Beach, Hell's Point, or Heron Ridge. It's also reasonably priced for what you get! Some large, mature trees -- unusual for a 'new' course. For touring, I personally recommend a trip across the river to visit the USS Wisconsin in Norfolk -- the Navy's largest battleship, which now floats retired for the benefit of the viewing public (that is, until it's reactivated again). For naval history buffs, there's no equal -- where else can you stroll the teak covered decks and admire the 16-inch guns of one of the most famed dreadnaughts our navy's ever seen? Not to be missed! Mon-Fri: $35, includes cart. After 3:00 p.m., $20. Saturday, Sunday, & Holidays: $45, includes cart. After 11:30 a.m., $35. Senior Rates, Junior rates & Portsmouth Resident rates available.